This is the story of Guy Petersen, a Vista del Monte resident, who served as a former Lieutenant Colonel for the U.S. Army Infantry during World War II. I served in the U.S. Army Infantry as a Lieutenant Colonel. I was based in Europe during World War II, as well as the Philippines. I was in Company H of the 63rd Infantry Division. I had four years of military science at West Virginia University, and I wanted to serve my country, so I enlisted. I chose the Army due to my university training. Life in the Army was strenuous, but interesting. We woke up at five in the morning and went all day long. I was with General Patton, so my quarters were pretty good. Once, I was shot through the shoulder of my combat jacket by a sniper in Germany. When I got back to my quarters, I thought I should see if the bullet broke the skin. It didn’t and because of that, I didn’t get a Purple Heart. 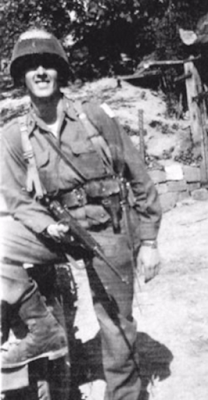 I did receive a Bronze Star and other medals: Rifle, Pistol, and Mortar. One of the most memorable experiences I had while I was in the Army was when I met the Von Trapp family in the woods of Bavaria! We were on a hill above the forest and we heard some noise, so we decided to investigate. As we walked in, we saw two adults and 12 children. If you saw “The Sound of Music,” then you know that the family was fleeing the Germans! The wife didn’t want to lose her husband to the Navy, and they were trying to escape. We checked them out, because sometimes the Germans put on civilian clothes and walked close to the American troops to catch them off guard. We took the family to our division headquarters. They were taken down south and finally to the United States. The Army also sent me to the Philippines, where General MacArthur was my immediate commanding officer. I enjoyed working with him. I spent a lot of time with MacArthur and his troops. I even rode on tanks with him. He always wore his pearl-handled pistols and carried his fancy rifle. He was a good soldier. The Army was good to me and I met a lot of interesting people, including some big Generals. I started in the Army as a Private. I took over a battalion in Louisiana and became a Lieutenant Colonel. During the Europe and Pacific wars, I lost just three men out of my entire company. I had a total of 23 years in the service. I enjoyed my time and was able to work with good leaders, such as General MacArthur.